The Diefenbunker is Canada’s – if not the world’s – only Cold War Bunker that is open year-round to the public and operated as a National Historic Site and museum. The Diefenbunker offers award-winning events and programming for youth and adults, including conflict resolution projects, corporate team building and the world’s largest escape room. We also offer a unique space to host events, meetings and celebrations. Despite our national story, we are not a federal museum. 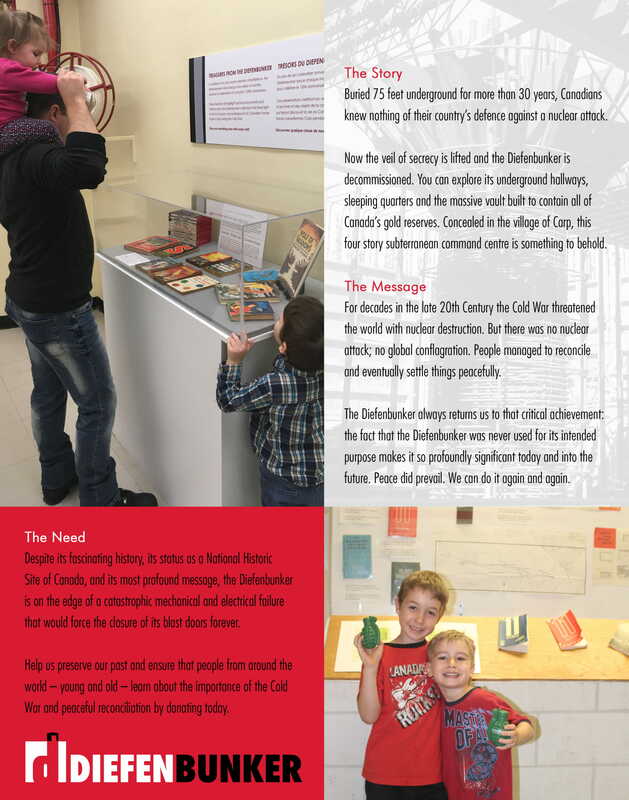 The Diefenbunker is a private, not-for-profit charity started by a group of dedicated volunteers. It now has 11 full-time staff. Funds go toward: A safe building that meets modern building code requirements, including electrical and air distribution upgrades that take place alongside other physical accessibility upgrades; an expanded youth engagement and education program where people of all ages and abilities can have a first-hand experience of Canada’s Cold War Museum; and a world-class discovery centre with leading interactive exhibitions. As we were founded by volunteers, volunteers remain an important part of our day-to-day operations. We have volunteer guides, board members, social media ambassadors, event volunteers and collections volunteers as well as a volunteer-run HAM radio station (staffed by individuals who are actively involved in teaching children and youth Morse code) and special event volunteers (including zombies). The possibilities are endless. Valentine's Day Touring Wine and Cheese is held Saturday before or after Valentine's Day. This is one of the most unique ways to tour the museum, learning about its history while also learning about wine. Escape The Diefenbunker is held year-round on Thursday-Sunday evenings. This is our triple-award-winning partnership that is also the World's Largest Escape room. Your goal is to save the world from a nuclear attack. It helps the museum reach a new younger generation of visitors who wouldn't otherwise come to the museum. The Whisky Tasting Fundraiser is held annually in November to raise funds for the museum, with a specific project chosen to support each year. It takes place in the museum, 75 feet underground.